Could Impress: Matthew Stafford. 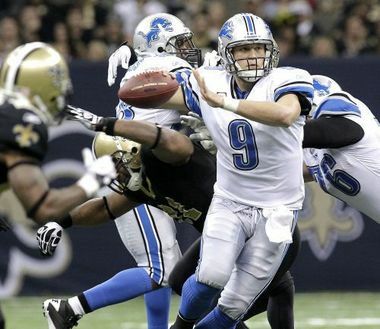 Despite the Lions tough loss to New Orleans on Sunday night, Stafford and the offense had an extremely good day. Minnesota allows more fantasy points to quarterbacks than any other team out there. You do the math. Could Disappoint: Andy Dalton. The red haired signal caller might be a media darling, but he’s going to have a tough time against the league’s best defense on Sunday. Don’t give up on Dalton just yet, however, with his week 15 and 16 matchups among the best out there. Injury Replacement: Joe Flacco. I wrote earlier in the season that no one had a better fantasy playoff stretch than Flacco and the Ravens. It all starts here against Indianapolis who has made a lot of subpar quarterbacks look like Aaron Rodgers. Forte is out for at least two weeks. Do you have a replacement? Could Impress: Michael Bush. We know you can run against the Packers, and Bush has a running style very similar to LeGarrette Blount, who torched Grreen Bay for 107 yards and a score. In fact, the Packers have allowed 100 yard rushers in the last three games. It’ll be cold and the Raiders would be smart to slow down the game. Bush should be a big factor on Sunday. Could Disappoint: Beanie Wells. Listen, Wells was absolutely fantastic the last couple of weeks and I know it’s difficult to sit the guy during the fantasy playoffs. But here are his totals against San Fran in the last matchup: 8 carries, 33 yards, 1 fantasy point. Enough said. Injury Replacement: Marion Barber. The Bears are built to run the ball, and Caleb Hanie has done little to convince OC Mike Martz that they should be throwing the ball more. He’s a grinder who will get plenty of carries on Sunday. Barber is likely the top waiver pickup in your league. Hopefully you put a bid in. What’s up, after reading this remarkable post i am too cheerful to share my familiarity here with mates.